NASA’s Mars 2020 rover mission, now being built at the agency’s Jet Propulsion Laboratory in Pasadena, will be carrying a piece of meteorite that scientists have determined came from Mars’ surface millions of years ago. A piece of a meteorite called Sayh al Uhaymir 008 (SaU008) will be carried on board the 2020 rover mission whose goal is to collect samples from the Red Planet’s surface that a future mission could potentially return to Earth. The Meteoritical Society has confirmed only 200 of such Martian meteorites, and keeps a database listing these vetted meteorites. This chunk off SaU880 will be used as target practice for a high-precision laser on the rover’s arm, according to a JPL news release. When Mars 2020 reaches Mars, it will be collecting samples from the surface that a future mission could potentially return to Earth. One of the rover’s many tools will be a laser designed to illuminate rock features as fine as a human hair. 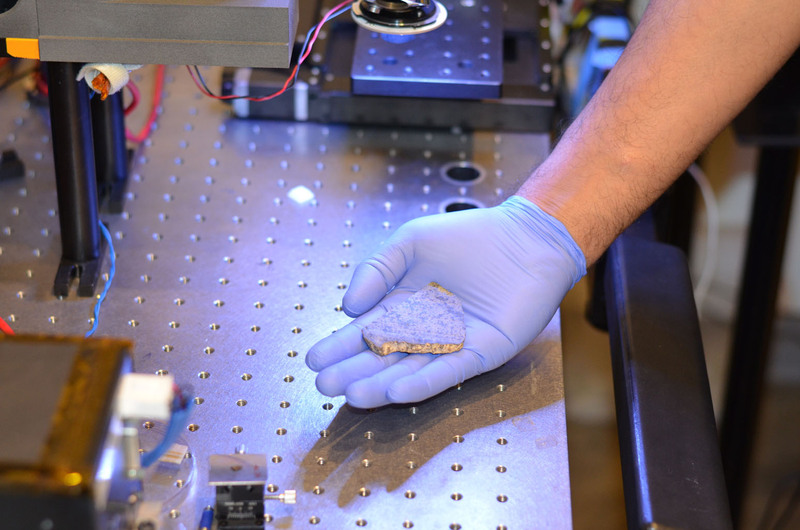 To calibrate that level of precision, a target – which may be a rock, metal or glass – is required so technicians could tweak the laser’s settings. SHERLOC will be the first instrument on Mars to use Raman and fluorescence spectroscopies, which are scientific techniques familiar to forensics experts. Whenever an ultraviolet light shines over certain carbon-based chemicals, they give off the same characteristic glow that you see under black light. Scientists can use this glow to detect chemicals that form in the presence of life. SHERLOC will photograph the rocks it studies, and then map the chemicals it detects across those images. That adds a spatial context to the layers of data Mars 2020 will collect. “This kind of science requires texture and organic chemicals—two things that our target meteorite will provide,” said JPL’s Rohit Bhartia, SHERLOC’s deputy principal investigator. To select the right Martian meteorite for SHERLOC, JPL turned to contacts at NASA’s Johnson Space Center in Houston, as well as the Natural History Museum of London. Not just any Martian meteorite would do: its condition would need to be solid enough that it would not flake apart during the intensity of launch and landing. The SHERLOC team ultimately agreed on using SaU008, which was found in Oman in 1999. Besides being more rugged than other samples, a piece of it was available courtesy of Caroline Smith, principal curator of meteorites at London’s Natural History Museum. SaU008 will be the first Martian meteorite to have a fragment return to the planet’s surface – though not the first on a return trip to Mars. NASA’s Mars Global Surveyor included a chunk of a meteorite known as Zagami. It’s still floating around the Red Planet onboard the now-defunct orbiter. Additionally, the team behind Mars 2020′s SuperCam instrument will be adding another Martian meteorite to their own calibration target. Along with its own Martian meteorite, SHERLOC’s calibration target will include several interesting scientific samples for human spaceflight. These include materials that could be used to make spacesuit fabric, gloves and a helmet’s visor.